Beer will change the world. We're not quite sure how, but its going to happen, and probably at the hands of microbrewers, homebrewers, craft brewers, brew makers, brewski boys, or whatever else they call themselves. In the past ten years, craft brewing has grown into a $7.6 billion dollar industry and microbrews now account for over 75% of all beer production. For you, brewing may be an extension of an old family tradition, a hobby to fill your weekends, or a cheap way for you and your buddies to get drunk *cough* freshman *cough*. For us, craft brewing means another opportunity to express yourself through full customization and creativity. Yes, we are talking about craft beer labels. 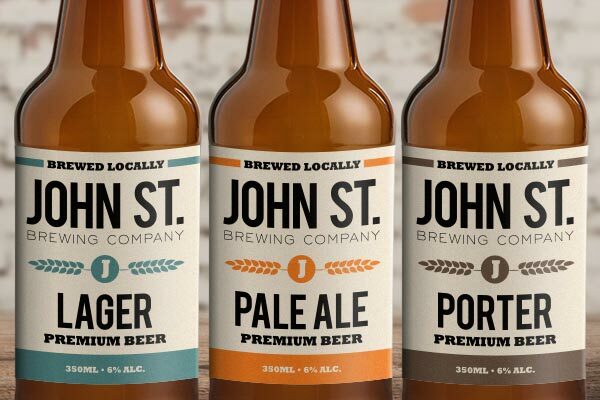 Creative packaging is key when it comes to craft beers (the beer is only as good as it looks), which is why StickerYou has created templates and designs specifically for your own line of deliciousness in a bottle. Each template fits perfectly in size to standard bottles and can be fully customized to your own particular style. Check them out here. Already have an awesome design? Not a problem! Simply upload to our StickerMaker Wizard and adjust the size to fit your needs. Our cut algorithm will contour die-cut around the edge of your label creating an awesome effect. Our regular white vinyl material is perfect for craft beer. It has great colour reproduction to really help your labels stand out. It is also waterproof, heat resistant and will apply bubble-free to the surface of your bottles. Doing a larger run? Our roll labels are a cost effective alternative. The paper stickers have a great adhesive and are laminated so they are also water resistant. We have no minimum order size. This means you can order as few labels as you wish, which allows you the ability to test out a couple different designs, or to label a couple different brews. Such flexibility is handy around the holidays if you decide to gift some bottles to friends or use them during a party. The StickerYou Crew loves beer (we have Beer Fridays, which is probably why we didn't get to your email- sorry about that! ), especially craft brews. We also love stickers and labels. So we will be more than happy to help you create some awesome labels for your special brand of rocket sauce. After all, "beer" and "cheer" rhyme for a reason. P.S: We also do custom Wine Labels! Make some pretty labels for that closet wine.